It is becoming increasingly clear that smartphones have infiltrated our daily lives mostly for the better. Not only do over three-quarters of Americans own a smartphone, an increasing number (around 20%) have completely gotten rid of a traditional landline in favor of a smartphone according to the Pew Research Center. Because of the prevalence of smartphones, a bevy of companies has emerged to help fill the need of keeping those devices charged. Anker is one of the most prominent ones. That, among other reasons, is why custom Anker power banks and portable chargers make a great promotional gift or incentive. There’s no question that custom Anker portable chargers and power banks will get a lot of use in their lifetimes. They also possess a lot of value both monetarily and practically. If you have your branding on any Anker device, you’re sure to accrue a lot of impressions because of how often the device will get used (especially in public). A gift or incentive like this will also produce positive feelings toward your brand. People in desperate need of a charge will only associate good things with your promotional Anker power banks and portable chargers. Before we talk about all the benefits of branded Anker products, let’s discuss a little about the products they have. At iPromo, you’ll find a large number of custom Anker power banks and portable chargers to choose from. Anker’s power banks and portable chargers are branded as “PowerCores” while their wall chargers are known as “PowerPorts.” The terms “power bank” and “portable charger” are essentially interchangeable. Power banks are small devices that you can charge at home and bring with you to help charge your phone later. They do not need to be plugged in in order to increase your phone’s battery life as long as the power bank still has a charge left. As you can imagine, the popularity of these devices has started ballooning in recent years as more and more people rely on their smartphones. Anker has some of the most popular power banks on the market right now. In fact, their Anker PowerCore II 10,000 device was Amazon’s best-selling power bank last year was recently named the “best all around portable charger” by CNN. The “10,000” in its name is a reference to how much of an electric charge it can hold (10,000 mAh), and you’ll find that most other Anker power banks use the same system. PowerCore 10,400 – Although it’s an older version, the PowerCore 10,400 still packs quite a punch. With a 10,400-mAh capacity, the device can charge an iPhone 6 and other comparable phones nearly 4 times. It also offers two USB charging ports so you can charge multiple devices simultaneously. PowerCore Speed 20,000 – This device offers high capacity charging at a higher rate of speed than other Anker products. It is also backward compatible Qualcomm’s Quick Charge technology, meaning that it can charge faster than standard USB chargers. With 20,000 mAh in capacity, it can provide a week’s worth of charges depending on the type of phone you have. PowerCore+ Mini 3,500 – As the name suggests, this entry in the PowerCore line is much smaller than the other, already relatively small devices we’ve mentioned. In fact, it’s literally been referred to as “lipstick-sized” and weighs only about 2.8 ounces. While it generally only provides a single charge for your phone, you can’t really beat its portability. PowerCore II 6,700 – While not as small as the PowerCore Mini, the PowerCore II 6,700 can comfortably fit in your pocket. It also packs 6,700 mAh of charging power into its relatively small frame. PowerCore Fusion 5,000 – This device brings you the best of both worlds serving as both a power bank and a wall charger with two USB slots. So, when you’re next to an outlet, you can just plug it in and have your phone charged the regular way. And, when an outlet is nowhere to be found, you still have charging capability. When it’s plugged in, it will charge your phone and then itself. We also offer other promotional Anker products, including wall chargers, car chargers, and even a mini Bluetooth speaker. So there’s a lot to like and a lot to choose from when it comes to Anker products at iPromo. But, why do they work well as promotional gifts? A 2014 survey conducted by the magazine, Scientific American, showed that most people really love their smartphones while equally hating their phone’s battery. The fact is that phones die on a regular basis even if they have an exemplary battery life. The resultant frustration will have most people frantically seeking out a wall outlet to get back online. In fact, a 2016 study conducted by LG revealed that 90% of smartphone owners experience some kind of “low battery anxiety,” a fear of losing battery life and missing texts, calls, or unique photo opportunities. On top of that, 32% of the people surveyed indicated that they would drop plans and return home just to charge their phones. Obviously, having a fully charged phone is important. So, why not be the company that gives people the added security of a full recharge? Your brand can effectively eliminate your customers’ low battery anxiety, and they will only be thankful for it. Custom Anker portable chargers fill a very specific and practically universal need. Travelers, people who go to festivals, outdoorsy folks, and virtually anyone else with a smartphone (which is a large number) will receive an advantage when they get one of these products. Branded Anker power banks will almost always be used in public, meaning that many eyeballs will be seeing your branding. On top of that, power banks aren’t quite as prevalent as smartphones yet, and anyone using your device will likely be asked what it is and where they got it. This, as you might expect, will understandably increase your brand’s favorability. Many power banks also come with multiple charging ports, allowing multiple people to charge their devices at once. This is again a great social opportunity to spread word of mouth positivity about your company. Many promotional products simply don’t have that component. We know that, according to Promotional Products Association International (PPAI), over 80% of promotional products are kept for longer than a year. On top of that, the PPAI says that around 80% of promotional product recipients will give the product away when they no longer need or use it. 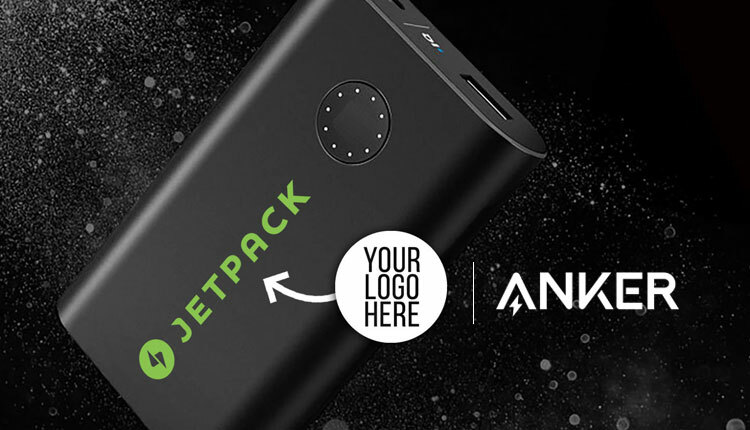 Of course, custom Anker power banks and portable chargers are not normal promotional products. They offer long-lasting value because they fill an important need that is felt by a large swath of people. A promotional golf ball, while valuable to a certain demographic, does not fill a need quite as important as a portable charging device. On top of that, an Anker power bank can easily be re-gifted. While we may have come to think of re-gifting as a bit unseemly, it’s actually great for promotional products. It allows the initial recipient to feel valued by the advertiser and any subsequent recipients to have positive feelings about the company, as well. So, even if you give promotional Anker power banks to a room full of people who already have one, people will still end up using (and enjoying) those devices. There is no way that a brand new portable charger will end up collecting dust in the back of a drawer. There is a reason that Anker has the top-selling power bank on Amazon and that CNN has lauded their products. They are exemplary. When you get an Anker product, you know you’re getting quality. Your recipients will understand that, and they will view you more favorably because of it. Even if they are unfamiliar with Anker as a company, they will certainly see the quality once they start using the power bank. These devices are not cheap knock-offs that will break down after a couple of uses. As we mentioned above, they are long-lasting and exceedingly valuable. It’s also always a great idea to have your brand associated with excellence, and Anker provides that in spades. A poorly-made portable charger will not be particularly exciting for your customers and they may view you as cheap and shoddy in that light. Don’t let that happen. Charging a smartphone or other mobile device is more important now that it has ever been. Custom Anker power banks and portable chargers can help your clients charge their phones on the go and cure their “low battery anxiety” with ease. These devices are also a great way to get your name out to the public. If brand recognition is important to you, you can’t go wrong with promotional Anker portable chargers, because many people will see it. At iPromo, the minimum amount of Anker products you can order is 50, which means you never have to spend too much. Contact a promotions specialist today to get started on a marketing campaign that is sure to yield results.